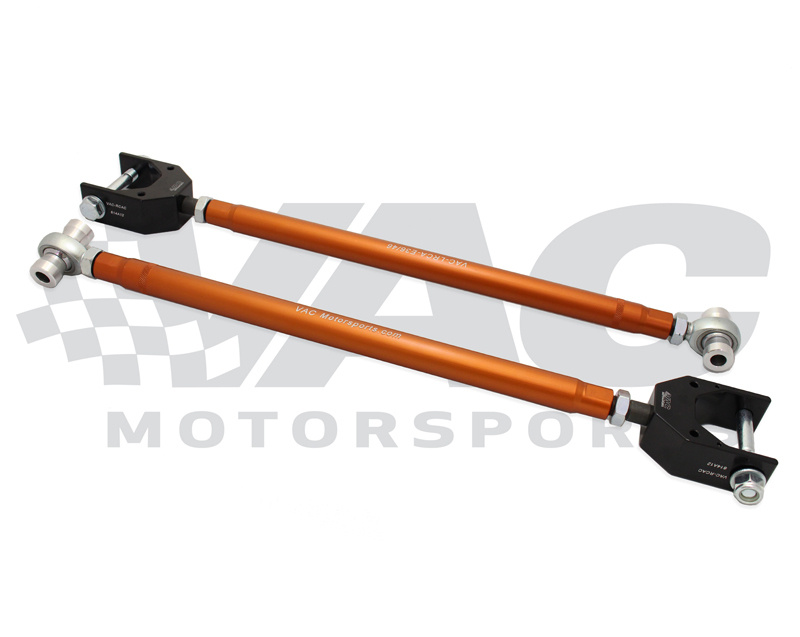 For added performance and camber adjustment, others may stake claim but our custom, fully CNC machined Adjustable Lower Rear Control Arms are simply the best made controls arms available for Spec E46. Use these arms when you need a wider camber adjustment range, and want to eliminate the play that plagues the rear suspension of these models. Designed for strength during thousands of miles of abuse but also engineered to deform incase of crash impact, our arms are light weight but have withstood over 9 years of constant use in the field, both race and street, with no failures. These are hard anodized and made with the best materials so corrosion will not be an issue. Premium SAE size high end USA Made rod ends are used for long life, precision, and quiet operation. Any engineer in the feild will tell you; USA made rod ends are much more costly but are a far better product with longer life and resistance to environmental contaminants. As well, SAE sized ends are much more cost effective, far better than metric sized counterparts, so you get better quality, and reasonable pricing and great availability if the time comes to service our control arms during the lifetime of your car. "Tuned thickness" Billet Aluminum construction means they are extremely light and ridged, to our specifications. Unlike steel arms, their construction enables them to not damage, or to minimize the damage to other suspension components in the event of a collision or track mishap. However, they are in no way weak, and have been used on rally and targa cars with success.